It has been 15 long years since Derek, Hansel and the nefarious Mugatu turned the world of high fashion upside down with the discovery that where goest thou runway model, so too goes an assassin. 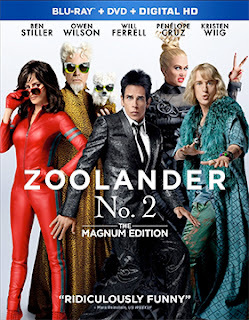 Paramount Home Media announced this week that their triumph return will be on May 24 when they reunite in Zoolander No. 2: The Magnum Edition. Consumers will have the choice between a stand-alone DVD edition or a Blu-ray/DVD Combo Pack. The ARR works out to 102 days and domestic box office receipts totaled $28.8 million. As we pick up the action some 15 years later, poor Matilda has succumbed to a horrible accident, little Derek, Jr. (well, no so little) is in an orphanage and Derek is out of the “business.” So it is now up to Penelope Cruz as Valentina (think: “fashion police”) to whip Zoolander into shape, reunite him with Hansel and set things straight! Well, as straight as they can be in the fashion world. It’s all great fun as Ben Stiller, Owen Wilson and Will Ferrell are given free hand to chew the scenery and are aided and abetted by cameos galore — from Justin Bieber, Katy Perry and Macaulay Culkin to Kiefer Sutherland, MC Hammer and Billy Zane as Billy Zane. Even Christine Taylor (the now-dead Matilda) gets her moment as well. And, we discover who Derek Zoolander’s real father is … yes, another cameo. If it happens once, twice or even a few times you can reasonably chalk it up to some random happenings related to the distribution schedule, or business affairs slow to give approvals or even over-eager retailers anxious to grab their “fair share” of the revenue pie. But when it happens literally every week, then there is something amiss; something mechanically out of sync with the way things should work in the home entertainment market place these days. 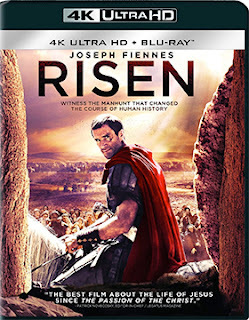 The latest theatrical release with a domestic box office take in excess of $25 million to get a street date — without an official announcement from the respective studio’s home entertainment division — is director Kevin Reynolds’ biblical mystery, Risen. 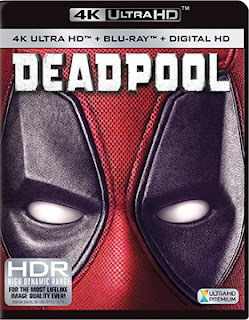 Everyone, but Sony Pictures Home Entertainment, has confirmed that May 24 will be the street date for DVD, Blu-ray and 4K Ultra HD/Blu-ray Combo Pack editions. That date yields a swift-to-market ARR of just 95 days. Ticket sales currently stand at $36.7 million. We suspect that VOD/HD windows, based on theatrical revenue performance measurements, are the driving mechanism triggering the dates for availability windows of the various viewing platforms. The PR people can’t seem to get the approvals necessary to get a proper press release out in front of the rush of retail and distributor date leaks. Despite not having an official press release Sony Pictures Home Entertainment, we already know what the special features will be for this story about Tribune Clavius (Joseph Fiennes) and his mission to discover what happened to the body of the crucified Jesus. Thank you, Walmart (Canada). 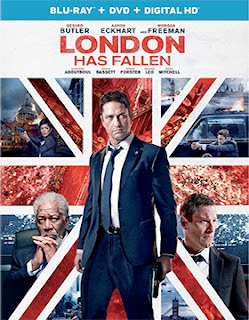 The all-action thriller from director Babak Najafi, London Has Fallen, will be making its way to the home entertainment market place on June 14 as both DVD and Blu-ray/DVD Combo Pack editions. 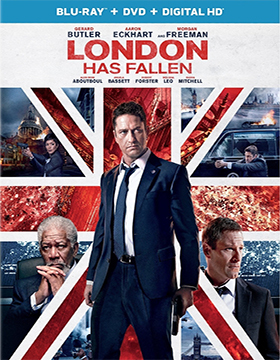 This CGI wonder (which is really well executed) — many of London’s favorite tourist spots are obliterated on-screen — arrives with an ARR of 102 days and domestic ticket sales of $60.8 million. All of the key cast members from Olympus Has Fallen — Gerard Butler, Aaron Eckhart, Angela Bassett and Morgan Freeman — are back for another round of “let’s kill the president” … and most manage to survive the attempt once again (which leaves open the possibility of another … Has Fallen sequel). 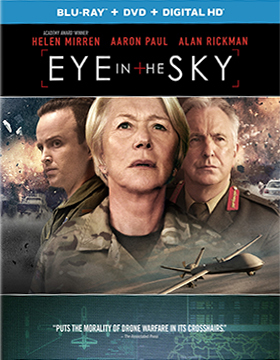 Also getting a Blu-ray/DVD Combo Pack and stand alone DVD push from Universal Studios Home Entertainment this week — and also slated for release on June 14 — is director Gavin Hood’s drone-strike thriller, Eye in the Sky, starring Helen Mirren. The ARR is 109 days and domestic ticket sales during the film’s theatrical run have rise to $10.5 million. Of note, this is Alan Rickman’s final film appearance. He succumbed to the ravages of pancreatic cancer in January of this year about seven weeks before Eye in the Sky opened theatrically. His voice will also be featured as the Blue Caterpillar in director James Bobin’s Alice Through the Looking Glass, which is will be released theatrically at the end of May. One of the greatest fan-interactive television series of all time ran from September of 1993 through May of 2002. Nine seasons, 202 episodes and two theatrical releases, but what made the show a phenomenon in the 1990s was the conventions and fan-gatherings that it spawned. The series in question is Chris Carter’s X-Files. He would attend and host these gatherings and make himself available to the fans. Mitch Pileggi was a regular as well, as were Brad Dourif (who played Luther Lee Boggs) and Peter Boyle (who played Clyde Bruckman). These were events that made the series more than just a television show. When the series ended and the two films ran their course, the fans simply would not go away. They wanted more and finally David Duchovny and Gillian Anderson — Mulder and Scully — gladly relented for a six-episode reprise, The X-Files: The Event Series, which began airing in January of this year. Mitch Pileggi and William B. Davis were onboard as well. 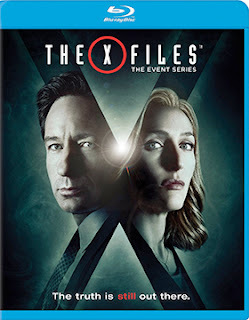 20th Century-Fox Home Entertainment announced this past week that Blu-ray and DVD editions of The X-Files: The Event Series will be available on June 14. As to bonus goodies, three of the episodes feature commentary options. These are: X-Files episodes and who was the writer of this episode); “Mulder & Scully Meet the Were-Monster” (episode three), features Duchovny and Anderson, who are joined by actor Kumail Nanjiani and writer/director Darin Morgan (another X-Files alum); and “My Struggle II” (the sixth episode), reprising Chris Carter, who is joined by Gabe Rotter (author and former writing assistant to Chris Carter during the production of the original series). Arrow Video, with domestic sales and distribution expertise provided by MVD Entertainment Group, has a genre-fan double-bill ready on May 24 that will appeal to both the purists and the casual viewer alike. 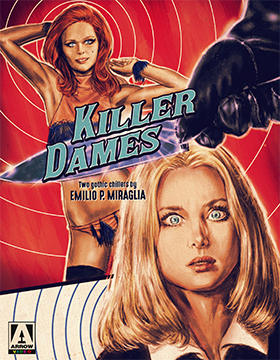 Titled (and it is a mouthful) Killer Dames: Two Gothic Chillers by Emilio P. Miraglia, it contains newly prepared 2K restorations from the original camera negatives of Italian filmmaker Emilio P. Miraglia’s Giallo classics from the early 1970s. The release SKU planned by Arrow is a double-disc Blu-ray/DVD Combo Pack. The films included in the set are: The Night Evelyn Came Out of the Grave (it arrived in the United States as an English-dubbed theatrical release in 1972) and The Red Queen Kills Seven Times (delayed until 1976, when it was released theatrically as an English-dubbed presentation by Cannon Films). For the purists, both of these Giallo films are presented with two viewing options … the original Italian language release, with English subtitles, and the domestic English-dubbed theatrical presentations. The Red Queen Kills Seven Times features a new commentary option featuring British journalists and Giallo/horror authors Alan Jones (“The Rough Guide to Horror Movies”) and Kim Newman (“Nightmare Movies: A Critical History of the Horror Film, 1968–88”), a newly-prepared video session with Sybil Danning, an alternative opening, four vintage interview sessions featuring the likes of production/costume designer Lorenzo Baraldi, actors Marino Masé, Barbara Bouchet and Ericka Blanc, and writer Stephen Thrower discusses The Red Queen Kills Seven Times. It will be an all-things Star Trek happening during the month of June as Paramount Home Media joins the 4K Ultra HD party with its first two selections, Star Trek and Star Trek Into Darkness. These will be 4K Ultra HD/Blu-ray Combo Packs and the street date will be on June 14. Of the major “Hollywood” studios, only Universal Studios Home Entertainment and Walt Disney Studios Home Entertainment remain on the 4K Ultra HD sidelines. Paramount joins Warner Bros., Lionsgate, 20th Century-Fox and Sony Pictures in supporting this newly launched format. Already opportunities have been missed, most notably Disney’s failure use the arrival of Star Wars: The Force Awakens as a touchstone for their entry into the 4K Ultra HD market. And even those studios that have jumped in have been a little slow on pushing the promotional buttons (this could be the result of, at this point, of a consumer base to support product releases in any meaningful manner). 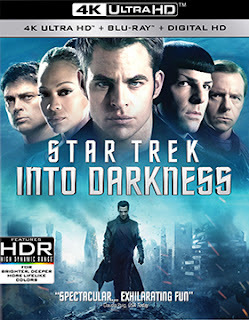 Filmmaker J.J. Abrams’ 2013 follow-up, Star Trek Into Darkness, also features a commentary, over a dozen featurettes, including “Creating the Red Planet,” “The Voyage Begins … Again” and “The Klingon Home World,” deleted scenes and a gag reel. 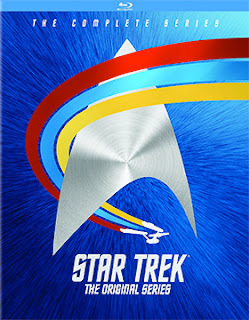 June 7 will see a massive 41-disc Blu-ray presentation of Star Trek: The Next Generation - The Complete Original Series and the following week, June 14, Paramount will be releasing 20-disc Blu-ray collection of Star Trek: The Complete Original Series. Eagle Rock Entertainment will bring The Rolling Stones to market on Friday, June 3 in the deluxe DVD/CD Combo Pack and Blu-ray/CD Combo Pack presentation titled The Rolling Stones: Totally Stripped (4 discs each plus a 14-track CD). 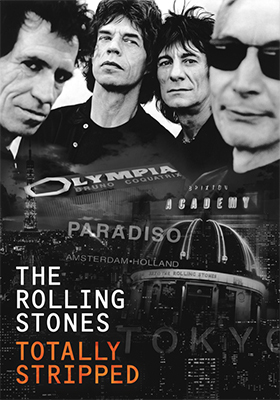 Included in the mix are a revised version of director Jim Gable’s 1995 documentary titled Stripped, the complete May of 1995 Amsterdam concert and the two July concerts of the same year filmed in Paris and London. Everything from “Jumpin’ Jack Flash,” “Brown Sugar” and “Honky Tonk Woman” to Beast of Burden,” “Angie” and more are here … live! Cinema Libre announced this past week that documentary filmmakers Jason Lazarus Auerbach and Scott Duthie’s Rising Tides will be making its DVD debut on June 21. The film examines the potential rise of sea levels and the economic impact that such a calamity would have upon coastal dwellers from Manhattan and London to remote island chains stretching from the South Pacific to Alaska’s Aleutian Island chain. What could happen in ten years … 50 years … 100 years from now … or tomorrow is the topic of conversation among such ocean-watchers as Gary Appelson of the Sea Turtle Conservancy, Todd Barber of the Reef Ball Foundation and Larry Beggs, the president of Reef Innovations. 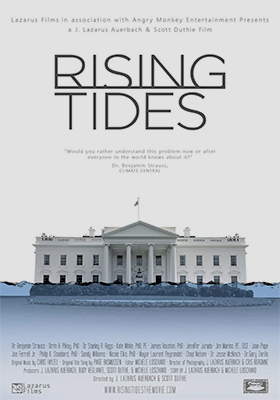 Rising Tides, examines what is, or can happen, and takes a realistic look at what can be done, with practical solutions, to battle coastline erosion and strike a balance between the acts of man and the will of nature. Director Tom Harper’s six-part mini-series adaptation of Leo Tolstoy’s timeless novel, War & Peace, will be available as double-disc Blu-ray and DVD product selections on May 10 from Anchor Bay Entertainment. Paul Dano (12 Years a Slave, Little Miss Sunshine, etc.) 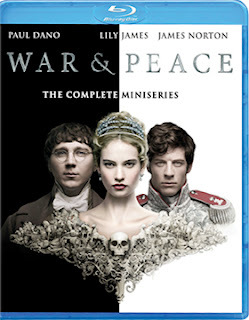 stars as Pierre, with Lily James (as Lady Rose in the Downton Abbey series) co-starring as Natasha, with James Norton joining the mix as Andrei. Is it the chicken or the egg that arrived first? It’s an age-old question. 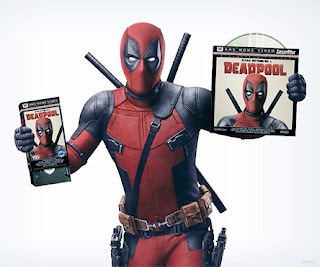 Did Ryan Reynolds, the star of Marvel Entertainment’s Deadpool, leak the release date of May 10 before 20th Century-Fox Home Entertainment had all of the I’s dotted and the T’s crossed on an official announcement … or was he simply parroting the news that amazon.com was already taking orders? He posted a picture of himself — in full costume — with a laserdisc edition in one hand and a VHS copy in the other. The humor was spot-on for the character. This little stunt (the selfie with defunct product format mockups) puts the ball in Reynolds court as the news breaker, so do the PR and marketing people over at Fox call Reynolds out on picking May 10 as the release date? I think not. So May 10 it will be, there just hasn’t been an official announcement with details as to bonus features … and there will be plenty. It’s enough to drive one crazy these days. The very competitive online retail community is always jumping out early with street dates for DVD, Blu-ray/DVD Combo Packs, and, in the case of Deadpool, a day/date buying option for the newly launched 4K Ultra HD format (being released as a 4K Ultra HD/Blu-ray Combo Pack). 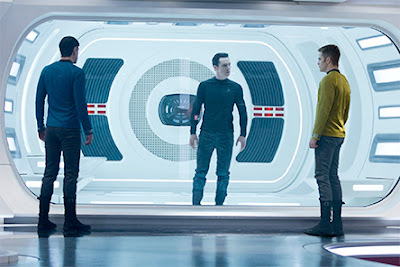 We suspect that VOD triggers — based on box office math — are lighting up future home entertainment windows before the studios are ready with the actual release news. It is all moving way too fast and stunts like Reynolds, as clever as it is, only makes it more chaotic. In any case, the ARR for Deadpool is a quick-to-market turn of just 88 days. It becomes the largest grossing film thus far to make the transition from local multiplex venues to the home entertainment market place in that timeframe. The industry average — the rolling average covering the past 12 months — currently stands at 112.9 days for all films with a domestic box office tally of at least $25 million (there are roughly 100 of those released annually). So Deadpool has shaved over three weeks off what would have been the expected release window for a film of this magnitude. Fox is likely trying to get it into the home entertainment arena before the big summer films — the new shiny objects — distract their target audience. Ticket sales were in the blockbuster range at $355.1 million (can you say “film franchise” — next installment is likely next year). If ever there were a perfect match been an X-Men character, Deadpool (aka: Wade Wilson), and the actor who portrays him, in this case, Ryan Reynolds, this is it. 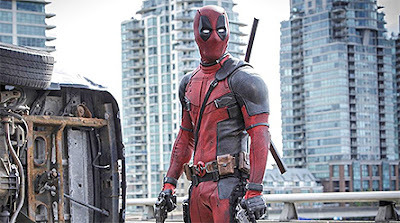 His irreverent and often sarcastic tone seen so often in his romantic comedies are spot-on for the anti-hero persona of Deadpool. And, this is one of those rare entries in a mega-dollar film franchise series where liberties can be taken — R-rated, violence, adult humor, etc. — without jeopardizing the core series. Yes, it is an X-Men film series entry (what are we up to, like eight now), but it can easily stand on its own going forward. Sometime next week we will get an official press announcement from 20th Century-Fox Home Entertainment … until then, bonus features will remain a mystery.